In this study, we present a 36 years-old patient had a left femoral neck fracture 23 years ago after which she underwent hip arthrodesis and she was examined due to hip aches and it was discovered that the implant was fractured and moved at a level which causes aches in the hip. The old implant that the patient had was removed and total hip arthroplasty was implanted. Recent developments in hip arthroplasty have begun to deem hip arthrodesis a rarely practiced surgical treatment. Nevertheless, the disadvantages of hip arthroplasty are evident with regard to young and middle-aged patients1. Therefore, practice of hip arthrodesis has decreased, but it is still applicable to those who are young and those who work in heavy works. This causes back pain and degeneration in adjacent joints. In this case, the patient underwent hip arthrodesis earlier and had sharp hip pains in her hip and her implant was broken. Therefore, she has been provided hip arthroplasty treatment. This 36-year old patient who had fallen down at the age of 15 and had a femoral neck fracture and then underwent an operation at external centre and she came to our clinic complaining about sharp hip pains. During the examination, it was discovered that the patients legs are asymmetrical and she had sharp pain on left hip. No neurological problem was discovered with the patient. During the examination of left hip Range of Motion (ROM), it was seen that she can achieve 30 degrees of flexion and 20 degrees of abduction. The radiography shows that she was implanted with arthrodesis in her left leg and one of arthrodesis plate and one screw were broken. No sedimentation, CRP and white blood cell count were elevated. The patient was informed about her current clinical condition and a total hip operation was planned. After the patient was given lateral decubitus position and then her left hip was penetrated with posterior incision. Fractured arthrodesis plate was reached. We took samples from the fluid around plate. As no infectious sign was found in this fluid, we carried on the operation. In preoperative and intraoperative radiographies, it was discovered that trochanter major did not develop and that hip abductor muscles were not functional. Therefore, old implants were removed, and total hip arthroplasty was implanted using constraint cup. No post-operative complication was detected. The patient was mobilized by stepping partially (Fig. 1, 2). 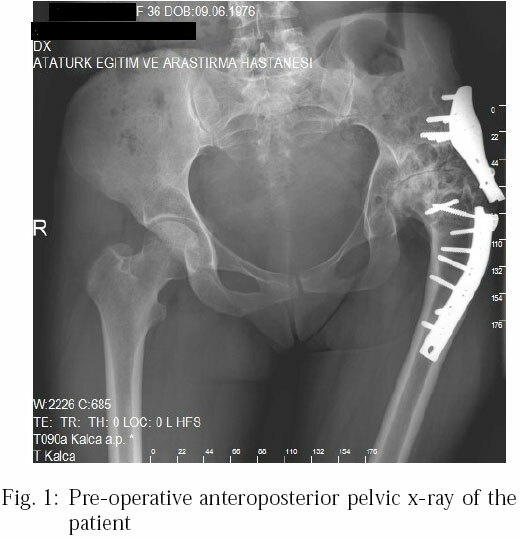 Hip joint arthrodesis is a successful surgical treatment for young patients with pains arising out of isolated joint arthrosis and with femoral neck fracture2,3. Nevertheless, long term studies have shown that it causes serious pains in the back, in the other hip joint and on the knee joints on the same side4,5. Although transition to total hip arthroplasty following hip arthrodesis is controversial, it provides comfort in some functions like slowing down degeneration of adjacent joint and easing back and knee pains6. In our case, we provided satisfactory movement space and transformed ankylotic hip into total hip arthroplasty without causing postoperative complications. 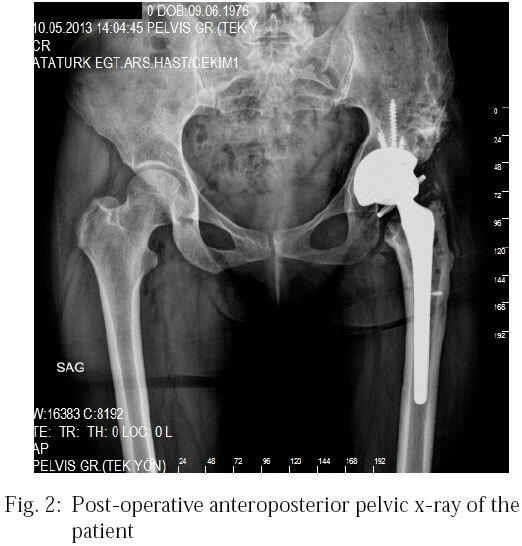 In the course of applying arthrodesis, we preferred constraint cup due to gluteus medius deficiency as trochanter major and adductor mechanism were not protected though intraoperative hip was stable. For heterotopic ossification, post-operative indomethacin began to be administered with 75 mg. In early stages after operation, the medicine was administered as much as she could tolerate. We have made up for extremity discrepancy of the patient and we obtained satisfactory results with regard to hip movements and functions which are consistent with literature. These problems further decrease quality of life of young patients and create problems which are difficult to treat.